Those are the words I was greeted with when my wife, Rocky, returned from what we thought was going to be her “once in a lifetime” volunteer trip to Kenya with Global Volunteer Network in October of 2007. She had fallen in love with the girls at St. Monica’s Children’s Home and two of them, Winnie and Joyce, had captured her heart in such a way that she felt compelled to make them an official part of our family. If you’ve ever met my wife, you know this… she is a force to be reckoned with. The first words out of my mouth were, “you know I’ll do whatever you think is best for this family.” I could argue, just for the sake of arguing, but in the end, I know that she would only fight for what she felt was best for everyone involved. It’s just who she is. That conversation changed our lives. That “once in a lifetime” trip to Kenya turned a blog created to give moms a place to have a voice for social good, into a charity by the same name, Mothers Fighting For Others. And it turned a desire to adopt 2 more girls into a actions that have changed the lives of 35 orphaned Kenyan girls forever. You see, what we didn’t know at the time we made that decision was that image of the home put forth by the priest who ran the old St. Monica’s, was a carefully crafted facade. These beautiful girls, who had already been through too much pain, were being taken advantage of in ways that became clearer and clearer as Rocky and other volunteers began to make more trips back to Kenya. When the truth was fully revealed, action had to be taken. Finally, in April of 2010, the girls were moved, as a family, into the house they now call home, and MFFO, in conjunction with our friend, Perpetua Gatome, and her Kenyan NGO, Sister’s Arise Project, took over the care and education of the girls. I leave for my first trip to Kenya today. I hesitate to call this a “once in a lifetime” journey. I know what happened the last time I did that. 🙂 This will be Rocky’s 10th trip in four years. And our 6 children, ages 6 to 17, will be joining us on this amazing adventure. The kids and I are finally going to meet our Kenyan family. For the last four years we have known them only through letters, photos and videos. 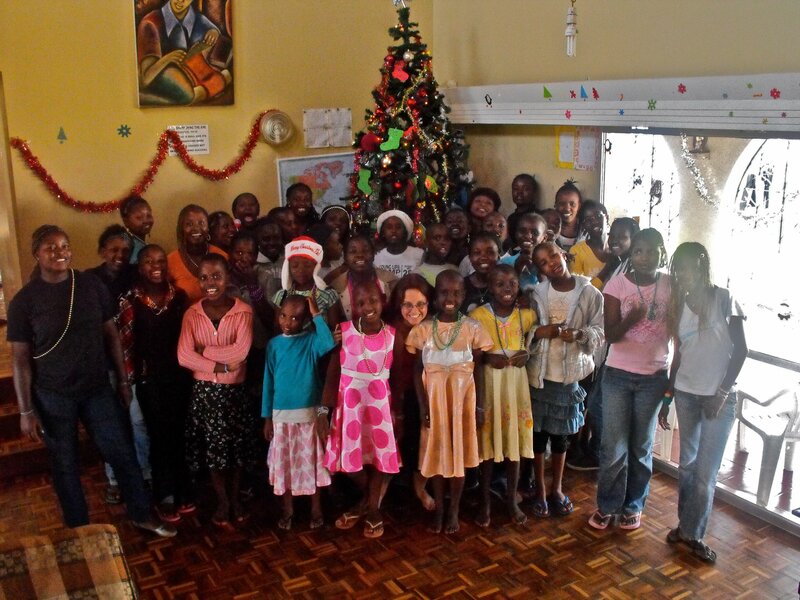 Our kids call the girls at St. Monica’s their “Kenyan Sisters.” The girls in Kenya call me Dad. And while I have marveled at the courage my wife and others had in fighting to put the girls into a safe home, and have cried many times listening to their story and watching their videos, I’ve been missing that final piece of the connection that will allow me to truly call them my Kenyan daughters. I will have that soon. I can’t wait to meet them face-to-face. I can’t wait to laugh with them and cry with them. I can’t wait to watch my 6 children play with their 35 Kenyan sisters. I know it will complete a picture that, for me, has been more than four years in the making. Safe travels to your family, Jeff. Give an extra big hug to my Ann. Enjoy every minute, revel in the kids’ smiles. This is amazing. I feel so humbled that you’re doing this and I am also happy that you guys have found this calling. It’s amazing to hear of stories like this and I’m very proud to know you even if just in passing. This is important, and thanks for taking the lead on doing this. You know how much we love you, Rocky and the kids! We can’t describe how overjoyed we are that you get to make this trip as a family and discover what your efforts have done in person. We know this will be a life-changing event and we’re glad we get to experience through all of you. Laugh! Cry! Enjoy the people you have touched so deeply that they repay you by calling you Dad. We have never been prouder to call you all friends. Jeff, what an amazing trip ahead for your Family. I wish you safe travels and look forward to all your stories. God’s Blessing to you guys and to the trip. Jeff and Rocky: You’ve taught us all so much about YEO (You Engaging Others) and this family trip to Kenya will likely have far-reaching consequences. Perhaps, more journeys and yet another picture will develop. Thanks so much for sharing your family! Happy New Year, and have a safe and wonderful trip! I’m looking forward to catching up and hearing all the amazing stories when you return. Just reading about the start of your trip warms my heart — I can’t wait to hear more once you get there! Be safe and give them all extra hugs from us! I cried reading this Jeff..and KNOW that you will have that special bond that Rocky found …and the reason she keeps going back and puts so much into this. It’s a ’cause’ that makes a difference…not only for the girls but you all. Much love, happiness and prosperity in the coming 2012! God Bless you both. Safe travels. Keep inspiring us to do better! Have fun, safe travels! I can’t wait to hear about it. Thank you for your support, everyone. It means the world to me. I’m chomping at the bit to get on this plane!! Safe trip, be blessed and may your hearts and theirs cherish this moment in time. Although the time may be short, the moments are powerful! Best wishes for safe travel, a fun trip and lifetime of memories to the whole Turner family! That is 41 children fortunate enough to call you DAD. The is the most touching story I have heard about all year. Safe travels to you and your beautiful family. So very proud to know you. Happy New Year Turner Family! The way I see it, Margaret, I’m the fortunate one. Thank you. One person can make a difference..continued success. One person truly can make a difference. I’ve seen it first hand. Thank you. What an amazing story. Jeff I had no idea that you and your family were involved with such a wonderful project. I look forward to hearing more about it when you return. Best wishes for a safe trip and I am touched by your wife and your generosity and commitment to these girls. Blessings! This was one of my favorite parts of our conversation at CRS! You are a blessing to many and it is a joy to see this story take shape. That is going to be one heck of a family reunion! Beautiful work, Jeff. Thank you to your entire family for giving of yourselves. What an amazing example for your children.